Microporous materials, including both zeolites and aluminophosphates are amongst the most fascinating classes of materials, with wide ranging important applications in catalysis, gas separation and ion exchange. The breadth of the field has, moreover, been extended in the last ten years by the discovery of the versatile and exciting ranges of mesoporous materials. Computational methods have a long and successful history of application in solid state and materials science, where they are indeed established tools in modelling structural and dynamic properties of the bulk and surfaces of solids; and where they are playing an increasingly important role in understanding reactivity. Their application to zeolite science developed strongly in the 1980's, with the initial successes in modelling structure and sorption, and with emerging capability in quantum mechanical methods. The field was reviewed over ten years, since then there have been major developments in techniques and of course the power of the available hardware, which have promoted a whole range of new applications to real complex problems in the science of microporous materials. 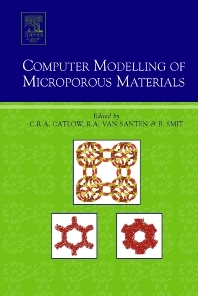 Computer Modelling of Microporous Materials aims to summarise and illustrate the current capabilities of atomistic computer modelling methods in this growing field. Chemical engineers, geologists, theoretical chemists, physical chemists, material scientists, in academia and industry. C. Richard A. Catlow is currently professor of Chemistry at University College London and Cardiff University. He has written more than 1000 research articles in his field. Berend Smit is Professor at the Department of Chemical Engineering of the Faculty of Science, University of Amsterdam. His research focuses on novel Monte Carlo simulations. Smit applies this technique to problems that are of technological importance, particularly those of interest in chemical engineering.